Well, what the heck, I review fruitcakes, let's take a look at the one that's just laying there, waiting to be purchased, right? 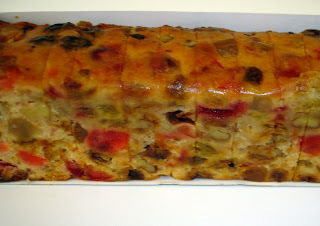 This fruitcake, 16 ounces of it, cost me $4.99, plus I think I got some extra savings on it through the grocery store. Obviously, no shipping. 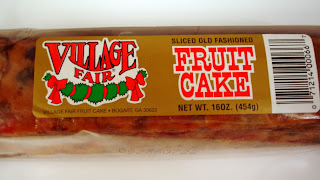 When I googled "Village Fair fruitcake," I was pointed directly to the website of Benson's Bakery, which makes me happy, as this was one of the fruitcakes I had on my list to review. Although this is a southern bakery (hailing from Bogart, Georgia), the quality of this cake places it decidedly into the Mass-Produced category. The fruits and nuts include golden raisins, cherries, orange peel, pineapple, and (interestingly) dehydrated papaya, and the nuts include pecan and walnut pieces. All of this is cradled, however, in a batter filled with ingredients typical of a mass-produced product: corn syrup, partially hydrogenated oils, high fructose corn syrup, and preservatives. The flavor and texture is nothing fabulous. The batter is more like a pound cake batter than other cakes I've tried. The fruits and nuts are cut fairly small, to match the smallness of the cake, but it's a bit dry. Also, I think it's the dried papaya that adds an almost a gristly texture to the cake. So, once again, this is a cake that makes me understand why so many people dislike fruitcake. As for where it should go on the rating scale . . . hmmm, I'll put it between Turnip 1 and 2 because of the interesting collection of fruit and absence of vegetables. I just discovered your blog and am quite voraciously reading though all the back posts. My father and I are big fruitcake fans but must fight the family every year to get one made at Christmas. We don't buy too many of them but make one each year. Reading your reviews has tempted me to purchase one just to try it. I'll have to carefully read now and pick out the best reviewed one. Erika - Good luck and happy reading!